Sure, you can change the disassembly font size in the Mednafen configuration file, but you can't change the register font, or watch font, or trace font, or the register alignment, or the memory editor font ... and you certainly can't make it use a larger debug display. But what I would really like is the ability to have a large debugger display without also having to stretch the game display. I have to stretch it 3 times vertically to fit the debugger with a 9×18 font, but then games are almost impossible to play/test. You would have to change how Mednafen calculates the window size to use ... but that could possibly be done. If you really want it, then you have the option to dig into the source code and make it happen! The same with this ... if you don't like it, then change it. Compiling Mednafen is really pretty easy, especially since I've provided a build script that you can change if you desire. 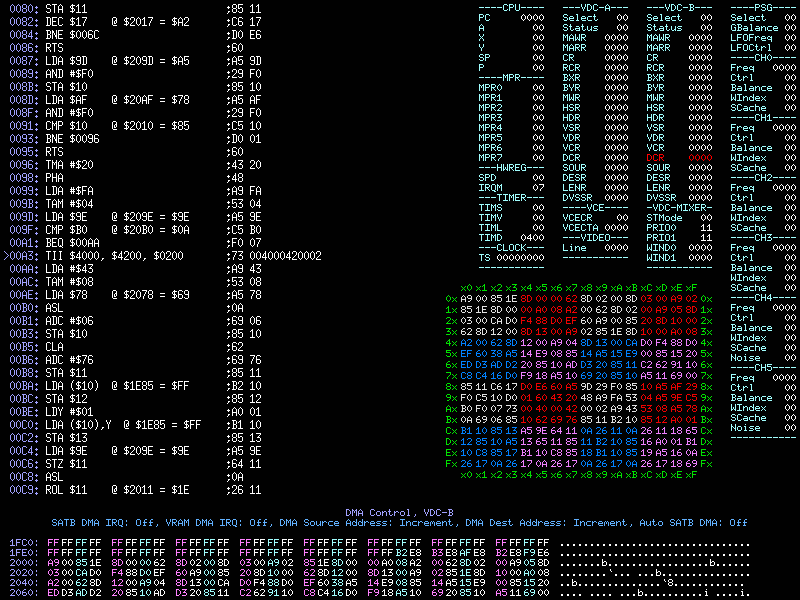 VB debugging with Mednafen, but without the eyestrain. The Mednafen emulator is (arguably) the best emulator to use for debugging your VirtualBoy homebrew game, because of its excellent compatibility and its wonderful built-in debugger. Unfortunately, the debugger defaults to using low-resolution 5x7 pixel fonts that are poorly defined, and then it displays them on small pages that are 640x480 pixel-or-less in size. This makes the debugging screens very hard to read, especially on modern high-resolution monitors. In order to avoid eyestrain and annoyance, I've patched the Mednafen source to use slightly larger and better-defined fonts, and then to display them on larger 800x600 pixel pages. Prebuilt Windows downloads are available in the following links for Win32 and Win64. The prebuilt versions only support the PC Engine, PC-FX, VirtualBoy, PlayStation and WonderSwan, but you can compile your own version with other console platforms if you wish. P.S. You have to click on the pictures to view them full size to really see the difference. As folks here may know, VBDE and VUEngine have been using my GCC 4.7 toolchain for a couple of years now, and so I consider it stable-enough for a public release. I've created a project on github for the patches and build script, and have confirmed that you can build the toolchain cleanly on both Windows and Linux. For the adventurous, you can now compile C++ code. Limitations are that there is no STL, and exceptions are not supported ... but that isn't much of a practical problem on something like the VirtualBoy (where you would be well-advised to limit yourself to the Embedded C+++ language subset). You need to do a couple of things in order to get compiled C++ source linking correctly, and there is an example of that in the "examples" directory of the "liberis" project for the NEC PC-FX console, also on my github. This would only be for development/debugging usage, and not for actual cartridges. 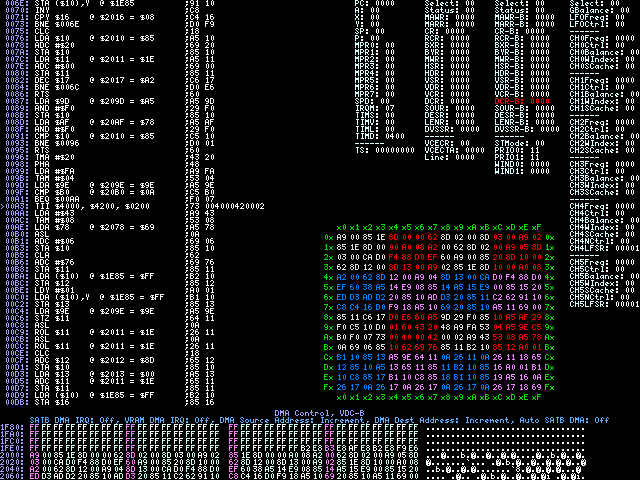 It's questionable whether it's even needed on the VB, since you can just make the cartridge image bigger ... but it never hurts to have more ram for debug traces. Putting it in the $04000000-$04FFFFFF region seems like it should be pretty safe. OK, thanks! I guess that I'll find another way to increase the amount of the VB's RAM (in the mednafen emulator, for debugging during development). VB GamePaks with expanded RAM? Nintendo's technical docs say that GamePaks can provide extra RAM in the $06000000-$06FFFFFF memory region. So ... I'm wondering, did any shipped games actually use that memory region? Perhaps for battery-backed saves? Thanks, I'll try it out! Where can I download your 4.7.4 patches so I can apply them to gcc? I'm sorry, because I know that it's not the answer that you want ... but I'd rather not just give out the basic GCC patches right now, but would prefer to wait for jorgeche and KR155E to release the next version of the VBDE (which includes an updated GCCVB). That's because jorgeche and I had to debug a few issues with GCCVB in order to get it to work with the new compiler. I'm afraid that I don't have the time or patience to go through that whole process again in order to support a separate GCCVB build. You might try going to the VBDE thread here and asking them how they're getting on with the new version. dasi put together a devkit for V810 that outputs Virtual Boy and PC-FX programs. I've been working with him to get certain things implemented, but as I don't really have much of a clue as to how GCC distributions work, it's becoming rather out of date and could stand to see a newer build. Interesting! I look forward to seeing it. A proper release will include a PC-FX API in the same vein and fix all of the outstanding issues (such as the current incompatibility with the C runtime). This obvious interests me the most ... although I'm not sure exactly what you're talking about. If you're trying to retain compatability with Hudson's old 1990s PC-FXGA SDK, then I'm not sure of the value, since that means no homebrew without causing a copyright violation. That's the point of my work to continue Alex Marshall's "liberis", which provides the foundations of a fully open-source PC-FX library. I'd love to get a committee together to weigh the pros and cons of combining the two devkit projects (GCCVB and devkitv810), but that would be stepping on dasi's toes. You may want to take a look at the next release of VBDE when it is made. VBDE builds upon GCCVB, and jorgeche/KR155E are taking advantage of some of the features in GCC 4.7.4, and fixing/improving some of the things in GCCVB to take advantage of them.